Well it's Christmas Eve and I just wanted to thank everybody who checked out my images and Instagram over the past year; the support from readers and sponsors I have received has been incredible, even during the times when I haven't been able to stay particularly very active - so thank you SO much! 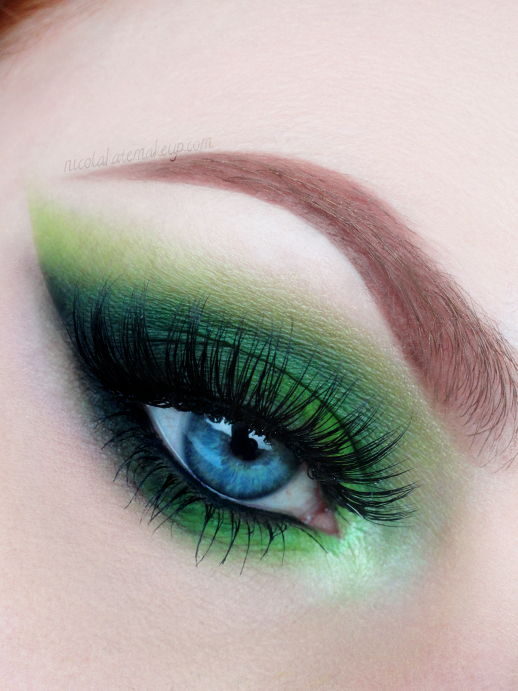 Fun matte bright greens today using my favourite colours, all from the BH Cosmetics 120 Palette. One of the palettes I bought so many years ago when I first started out in makeup, and is still going strong! As it's almost Christmas, this reminded me of the Grinch... So with that I hope everyone else is looking forward to Christmas as much as I am! 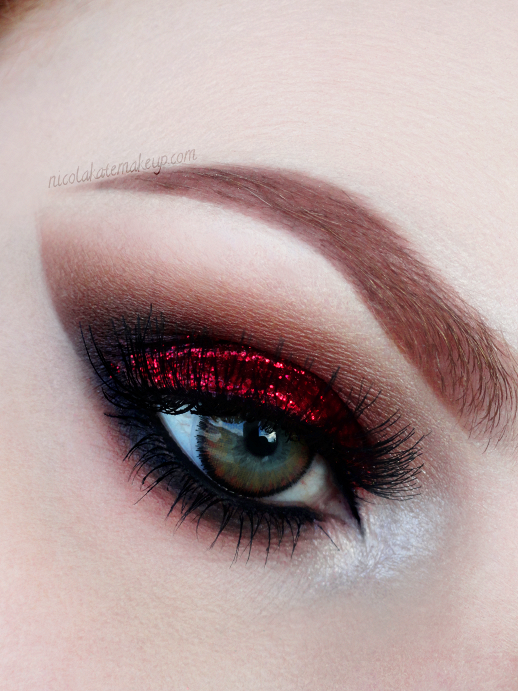 Here's one last fun look before I move onto more Christmas and party appropriate looks for over the holidays, using shadows from Concrete Minerals. Of course I couldn't resist throwing in some multi-coloured glitter! I'd just like to note that the 'Hustle' eyeshadow from Concrete Minerals that I used around the inner corner is actually more of a mauve-pink shade, but in my lighting appeared to be more of a lilac. I also used my blue Misaki contact lenses again to enhance the natural colour of my eyes. I still have a discount code enabling you to receive 10% off your Misaki order - just enter "KATEMISAKI" at checkout and you're good to go! Also featured in this look is one of the brand new lash styles from Girls With Attitude. Aren't they pretty? GWA have been one of my favourite lash brands for quite a while now, and they've definitely upped their game with these new styles. Can't wait to show you more of the new styles! Hope everyone is enjoying December so far and looking forward to the holidays! 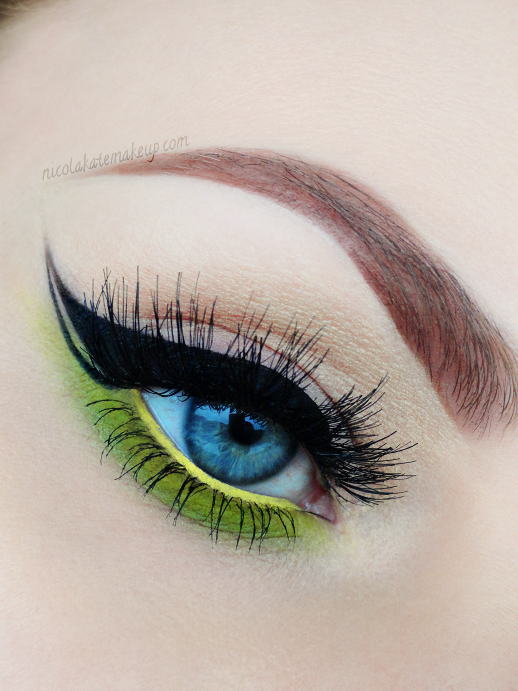 Another straight-forward look today, with the focus again being on the eyeliner. This liner was inspired by a look I did waaaaay back that received good feedback even though it's quite simple, so I thought I'd give it another go. These no-nonsense, uncomplicated, liner-focused kind of looks are actually my favourite to do, as being able to get my liner to a standard I am happy with was probably the skill that took me longest to learn so I do quite like to show that off! Green is one of my favourite colours although I don't use it too often due to my colouring, but thought this pop of lime green and touch of yellow finished this look off nicely. 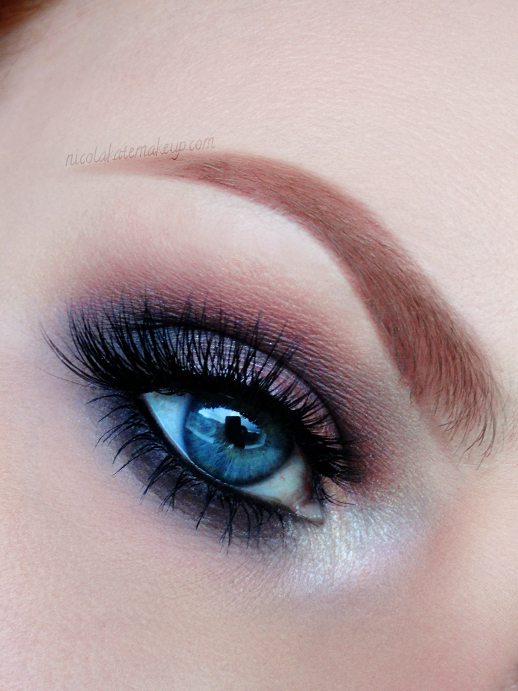 A soft and feminine wearable smokey eye, this time using the more neutral shades from the latest Anastasia Beverly Hills 'Self-Made' palette. 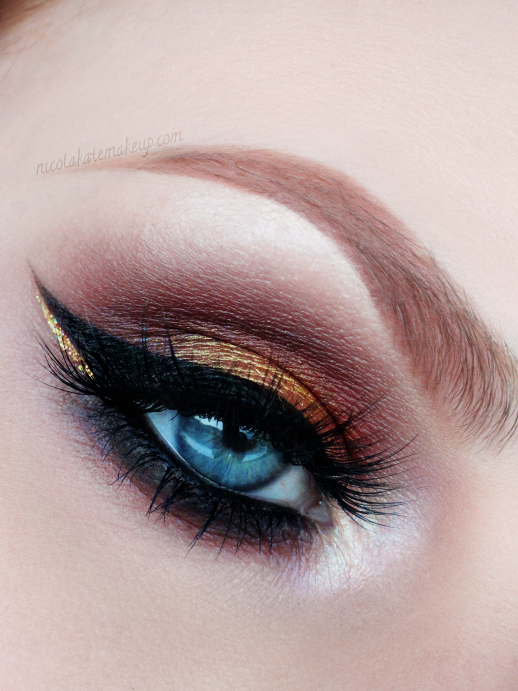 A smokey autumnal eye featuring shadows from the newly released 'Flaming Love' palette from Makeup Addiction Cosmetics. I'm a huge fan of Makeup Addiction's brushes, pigments and highlighters so I was so excited when I first heard about the release of this palette on Instagram. The palette features 8 stunning eyeshadows - all with a hefty 3.5g of products each - in an array of brights, neutrals in shimmery to matte finishes. 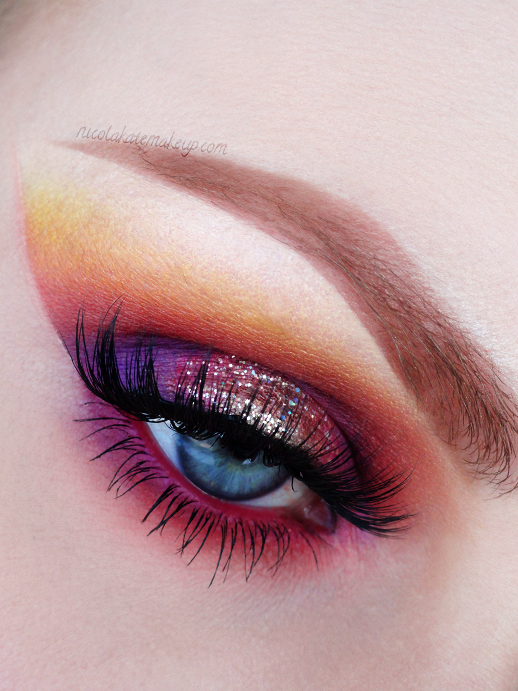 You can see my images and swatches of the palette in full HERE! Anastasia Beverly Hills Dipbrow Pomade in 'Auburn. 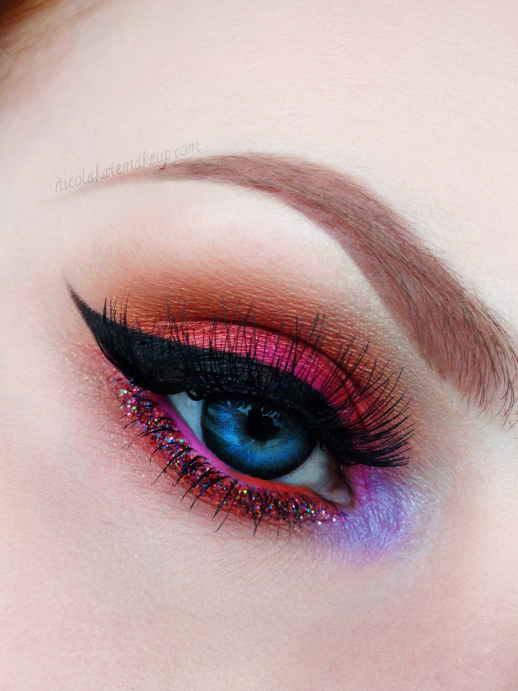 A simple grey, shimmering smoked out shadow all over with a vibrant winged out liner and a pop of glitter. I love using liquid lipsticks that dry matte as liquid eyeliners when it comes to wanting a more unusual colour choice to amp things up a little! I also used another pair of Misaki contact lenses to enhance the natural colour of my blue eyes. Don't forget you can get 10% off your Misaki order by entering my code 'KATEMISAKI' at checkout! My first look using the most recent Anastasia Beverly Hills release, the Self-Made palette! Everybody over on Instagram is going crazy over this 'Deep Purple' eyeshadow and I'm no exception... Being a lover of purple, it was obviously one that I had to try out first, and here is the result. This look also features my first look at some Misaki contact lenses that I received a couple of weeks ago. The lenses I received are all very natural looking compared to some of the more dramatic style lenses out there, and are extremely comfortable to wear. I thought these 2 tones green circle lenses really complimented the shadows that I decided to use today and was really pleased at how they seemed to finish the look off perfectly. You can also get 10% of your Misaki contacts lense order by entering my code 'KATEMISAKI' at checkout! Happy Halloween! Here's an easily achievable demonic possession look for you today! I'm not going to list everything I used for his, as it was put together using basic browns, warm-hues and black eyeshadows, most of which can be found in cheaper palettes such as the BH Cosmetics 120 palettes. Products that pretty much everybody owns and are very non-specific. I used my regular foundation all over (because I am pale as hell anyway...), and contoured my cheekbones, nose, and inner eyebrow area with browns and blacks. I used the same products on the eyes, starting out with a warmer, reddish toned brown blended all around the socket area, and then finished off with a black all over the lid and lower lash line, again blending this quite far out. For my lips, I used my usual, lightest concealer all over and applied a black eyeshadow to the center, avoiding the most outer sections of my mouth. For the eye and mouth details, I used the same brown eyeshadow I used throughout to lightly trace where I wanted my markings to be with a small eyeliner brush. Then - making sure to stay closer to the eye and mouth - defined the lines with a black eyeshadow and a light hand, to give a faded effect. 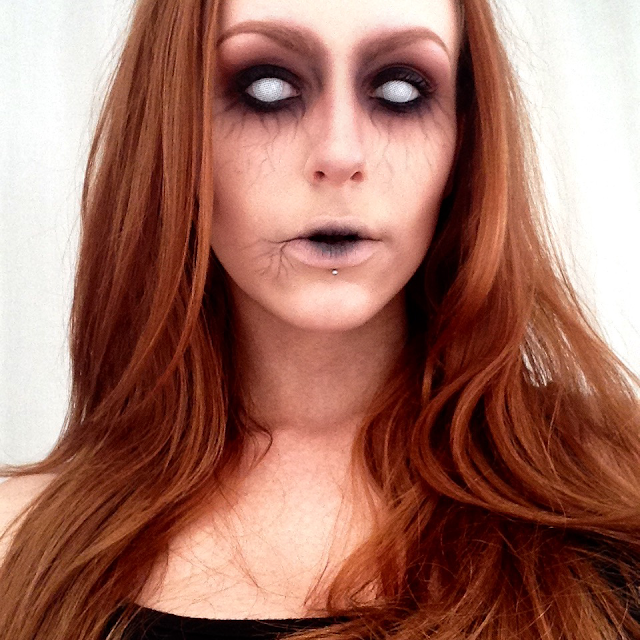 I finished this look off with white mesh contact lenses that I purchased from http://www.huntordye.co.uk/ , and made sure I didn't bother brushing my hair... Creepy, right? I thought I would make good use of these gorgeous jewel toned eyeshadow from Anastasia Beverly Hills before returning to the less-than-pretty Halloween looks next weeks. 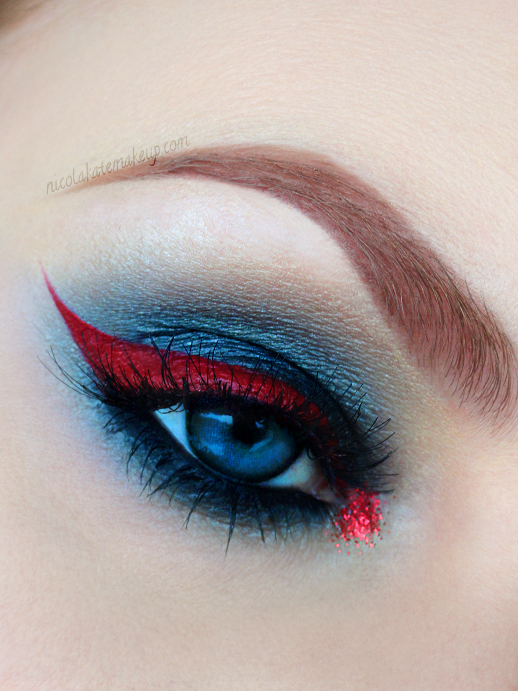 This was put together mostly with single eyeshadows, with the exception of a couple from the Shadow Couture palettes. Although the Anastasia Beverly Hills eyeshadows are AMAZING, I sometimes like to try and put together looks like that are easily adaptable and can be created with similar shades that can be found in cheaper, budget brand palettes. And I think this is one of them! 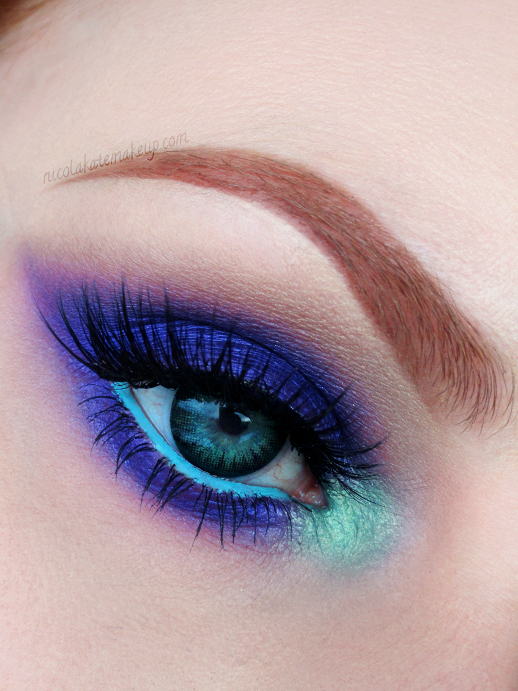 I used my full set of Ultimate Eye Set brushes from Makeup Addiction Cosmetics to create this look. Another Halloween idea today, inspired by pastelpegasus over on Instagram. 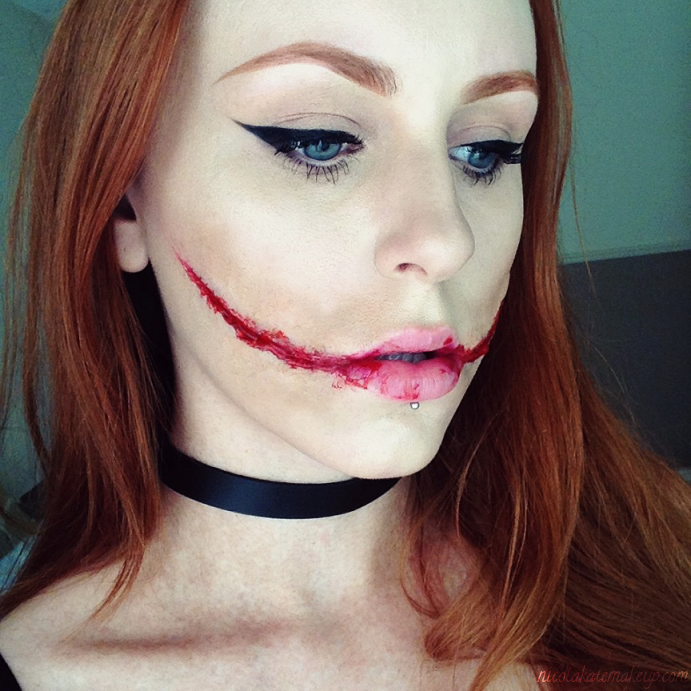 This stitched mouth makeup is fairly easy and doesn't use too many products, although is a little bit fiddly when attaching the stitches. Absolutely not suitable for long-wear, parties or if you are keen on breathing through your mouth... :P But looks great for photography purposes! After applying a ghostly liquid lipstick, I then applied little dabs of special effects wax around my lips, covering them with a medium brown eyeshadow and followed by a yellow to create a bruised effect. I also used a tiny amount of a red eyeshadow lightly dabbed in the center of the scar wax. I then used a latex-free brush-on eyelash glue to secure the cotton stitching after measuring it up for each 'hole', and then went over this with a gel blood applied with a small eyeliner brush. The glue and the scar wax help give the appearance of a 3D stitched effect. Lastly, I then went back in with my yellow eyeshadow and lightly stippled it over each hole to replace any colour that had been lost while applying the glue. And that's it! Creepy! Not long to go until Halloween now! Weee! I decided to start a little early and have been playing around with scar wax for the first time. Since I didn't really know what I was doing or hadn't the foggiest on how it would turn out, I thought I'd start out with something that seemed fairly simple. So here we have a little chelsea smile action going on. I just used my regular foundation and concealer all over my face for my base, and applied my liner and brows as normal. Once I had applied the scar wax and made the 'incisions', I set the scar wax with powders that match my skin tone before painting on liquid lipsticks to the insides of the wound, just to give it a nice solid blood-red base before applying gel blood. I finished it up by using a light matte brown eyeshadow to the surrounding areas, just to give some definition and more of a swollen and irritated look. Taken with my iPhone 5 front camera so not the best of quality, and I did apply a filter afterwards to make myself look queasy and poorly but hopefully you get the idea of how this would look in person! I dug out my old BH Cosmetics 120 palette today - This palette was one of the first palettes I ever bought when I first started posting makeup photos, since I couldn't afford or have access to higher end products and needed a lot of colours to play around with. To this day this palette still remains one of my favourites for value for money. The quality is decent and there's pretty much every colour and finish in there. There are quite a few brands that stock this kind of 120 palette and I'd recommend them for anybody working with a budget or first starting out. They are fantastic to practice with and mine is seeming to last forever! I hope you like the look I put together today using all shadows from the 2nd Edition. Putting another gorgeous pair of cruelty-free mink lashes to good use today! 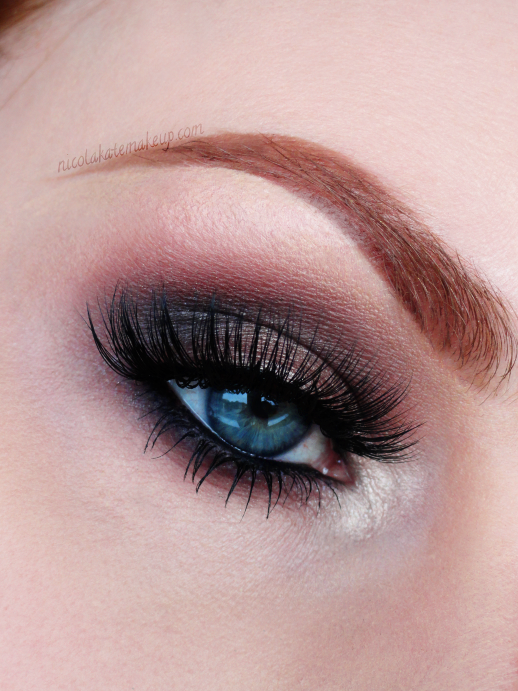 I love this soft, fluffy and flattering pair from Sweetheart Lashes. This is just my usual, everyday eyeliner look with an added pop of colour, courtesy of the Anastasia Beverly Hills Creme Colors. 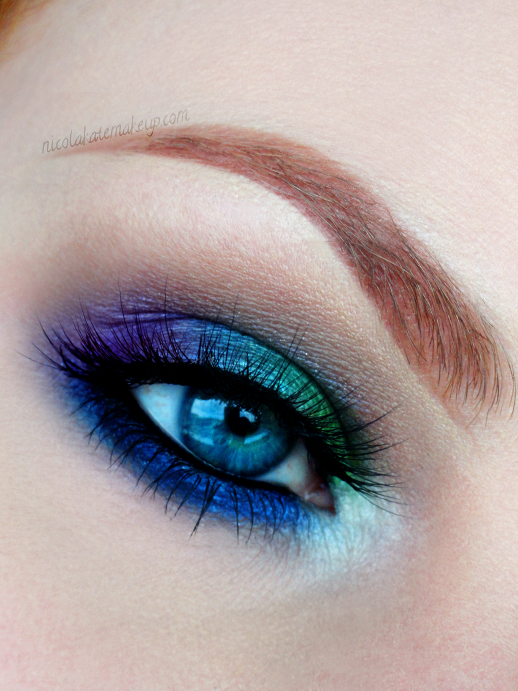 A very easy yet eye-catching look that makes use out of minimal products. 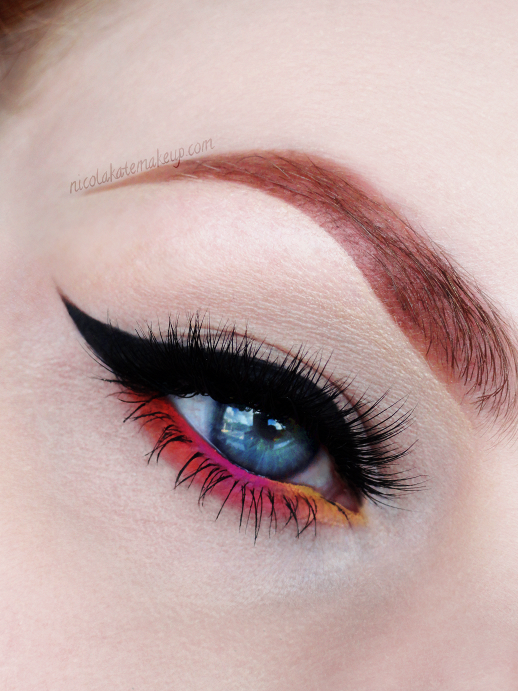 Another brilliant use for matte liquid lipsticks is to use them on the eyes (providing they are eye-safe, of course!) 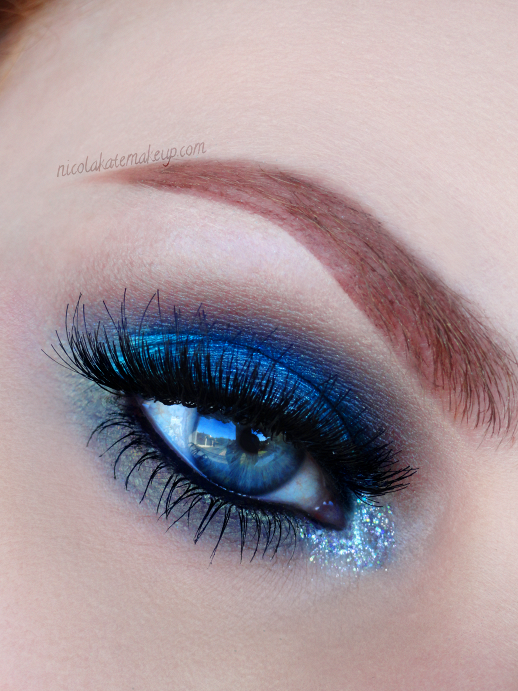 and I couldn't resist using this extraordinary blue liquid lipstick by Anastasia Beverly Hills as an eyeliner. I simply put a little bit of product on the back of my hand and applied it as you would with any other cream, gel or liquid liner with an eyeliner brush. 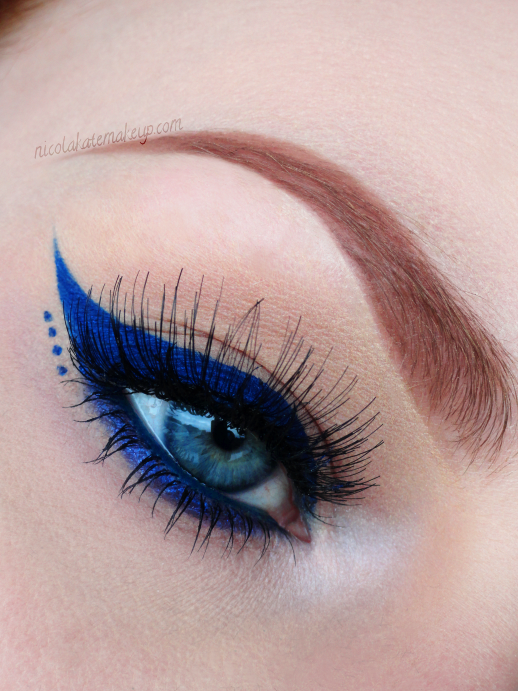 Paired with a matching shadow and pencil liner along the lower waterline for striking blue overload! I have some gorgeous new goodies to play with - firstly the new Energy Noir palette from Tarte, which is a shadow and blush palette consisting of 9 taupe, mauve and plum shades and 1 generously sized subtle pink blush. Secondly, these beautiful 100% mink false eyelashes (cruelty free, of course!) from LovableLashes. I'm excited to share these with you as they are the most affordable mink lashes I've come across to date, starting at only £11.99 a pair! It get's better though, as the lovely team over at LovableLashes have also provided me with a 20% discount off your first pair for my lovely followers. Just hit in LOVABLE20 at checkout to redeem!